One of my favorite parts of writing this blog is having people contact me and offer a giveaway product! I LOVE it! Simply Sweet Marriage.com is a site devoted to strengthing marriage through intimate products and romance. Its goal "is to provide the resources, products, and apparel for husbands and wives to cultivate and increase marital intimacy and make marriage a place of refuge." It sells some fabulous products, cute freebies, and even provides education on various topics applicable to marriage. I "flipped" through it on Amazon and it looks fantastic. 3. Make sure I have an email address to contact you at or that I can actually get to your blog from your comment. Also, stop by Simply Sweet Marriage and tell THEM or ME (in a comment) what you think about their site. What do you like best? Is there a product you particularly liked? Please take the time to provide a little feedback. ---much appreciated! I've been a follower for about a month and I love the ideas on here! I plan to surprise hubby with a special dinner that involves his favorite foods, put the kids to bed early and actually spend an evening talking together with no distractions. I'm also a follower! My next date with my fiance won't actually take place till sometime in October when I see him again (we live long distance). I like the christmas in July idea, I hope I can try it soon! Our next date will be a game called "The $5 present game." I got the idea from a book my mom gave us when Michael came home from deployment. The point is you each take $5 to a store like WalMart and then split up to buy your spouse a gift that they'll love or that's meaningful but you can't go over $5! Its really fun because its so challenging. I'm a follower. My next idea is to get a sitter and go to a movie together. We have only been out alone twice in the past 2 1/2 years! I just took hubby on a surprise date, he had no idea where we were going on the way. I gave him a card in the car with a ticket inside to a burlesque show. We went there and then I surprised him with an amazing steak dinner at a fancy restaurant over looking the city. It was a great night!! What a fun book. We hardly ever get a date, so I'm excited that we will have a babysitter in a few weeks! My daughter will be staying overnight at my Mom's and I am planning for us to order some Chinese and watch a movie. We used to do this every Friday before we had her. Since we have a newborn it's nearly impossible to have any "romantic" time since nothing kills the mood like a crying baby! I modified your grocery store idea to make that a fun time for us since it's about the only time we spend together right now with our schedules being so hectic. We will do your mocktails date this week end. Thank you for your blog and all of your ideas. ON our book store date I flipped through that book and loved it but I DIDN'T buy it SO I would love to win in! I’m a follower and let’s see…my fiancées birthday is coming up and I plan to decorate the living room and kitchen while he is sleeping in. When he comes down stairs he’ll be surprised to find a our home all decorated just for him. My husband has been rigorously working on building a fence for us the past week or so. He's nearly done and once that happens I will try an evening picnic in our backyard. He loves firepits, so I'll get some wood for ours and we can stay up just the two of us, chatting and enjoying each other's company. I'd also like to try my hand at the Rice Kisspies and/or the giant "kiss" cake (for dessert that evening, of course). Hi Cher!! I'm a follower!! We will be doing stuff from the long distant love section! Will is about to go away...But I am kinda excited!! We are going to have video chat dinners, and virtual movie nights! I have prepared cards for him to open on certain days that will tell when to meet me and where...like dinner at 7:30 at the Log-On Cafe!! We've been dating nearly a year, so our next romantic night will be our anniversary. I think we're replicating our first date, which will be wonderful. Besides that, I plan to use your under the stars date idea sometime very soon! I AM A FOLLOWER!!! I love this blog and the cute and wonderful ideas it gives me. I felt like after rhaving our first child that we just got boring and your blog has helped changed that. We can now have fun and "date" at home without feeling bored or boring :) Thank you for that! My next plan for a date is to get away from everything and find a secluded place, camp out for a few days,mainly just getting away from it all and spending real time together without technology to entertain us. My next date I'm planning with my husband is Tuesday...It's not muc creative but it will be fun! We are planning on going to the LDS Oquirrh Mountain Temple open house and then out to eat at Olive Garden.We're planning our date Tuesday because I will leave out of town for the rest of the week without him. Also I was going to leave him some Rice Kisspies for him to see Wednesday morning when I'm gone. I'm going to "kidnap" my husband and take him out for a romantic dinner/picnic and movie in the park. I can't wait!! I love all of you're ideas and a book would be awesome! Our next date we're going to our neighborhood pool and the hot tub then heading home for a movie and snuggling on the couch. I am new to this site but am already a follower =) I was just telling my husband that we need to go on a date. This saturday we are going to get his mom to watch our son. We are hoping to go to one of the most beautiful places we know around our area (its free =)). I then plan on creating a fantastic dinner, With candles and dim lights. Then a Movie or swimming! Our next romantic date...I have couple of ideas, nothing to complicated: picnicking at the local winery or taking a row boat out where we took photos for our wedding. Oh I hope I win! Our next romantic date night will be next weekend. We are going to drop the kids off with Grandma and Papa go out to dinner and then get a hotel room and then in the morning we are going to the "beach" (as much of a beach as you can get in UT) and having a picnic. I am a follower. My next "date idea" with my husband is going to be tonight. We have wanted to make frozen Hot Chocolates and watch a comedy routine he hasn't seen in a while. It will be pretty low key but I love just hanging out and laughing with my husband. It's so fun! I am a member. We have had very few dates this summer, so we are planning to catch a movie next week. We love your blog. I've been a follower for a long time now. :) We don't get to go out on real dates much but I leave him little notes in his reese's peanut butter cups and use the cute little ideas like that when you post them. Oooh! Pick me! I follow you. The next romantic thing I'm going to do is your Hershey Kiss Rice Kripy Treat idea. I'm a follower and love all your ideas. I plan on giving my husband th sweet treats jar. I also plan on doing the love dr. idea. 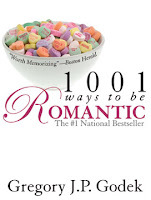 I would love a book of ideas on how to be more romantic. My email is jjw258@yahoo.com. I'm a follower! And we'll be traditional with pizza and a DVD - I'll have to think of something to spice it up! Just became a follower...what an awesome blog! I AM A FOLLOWER!! I LOVE YOUR BLOG!! THE KIDS ARE GOING TO G-MAS, SO, IM THINING THERE IS NO PLACE LIKE HOME (WITH NO KIDS)! HAHA!! EMERALD CITY HERE WE COME!! My husband just started a new job and has a pile of things to take to his new office, I slipped in a jar of "sweet treats" as a sweet little surprise for him! Thanks fo all of your fun ideas! The next romantic thing I have planned with my husband (besides a passionate goodnight kiss) is our Anniversary. It will be our second anniversary and we do not have the budget this year to go somewhere. I told him about the "Slice of the Big Apple"
He loves the idea and we will put something together. Most likely the place will be London though. I am very excited about this! Thanks for all of the fabulous ideas! I realized I forgot to put my email address! I'm a follower and we will be taking a romantic weekend getaway this month for my birthday. Hooray! My husband is currently in Afghanistan, and when he gets home I will be 8 months pregnant, so it might be awhile before we get too romantic =) but I hope to take a romantic vacation (our first real vacation together) without the TWO kiddos! I'm planning a home-Chili's night for this coming Wednesday. We'll have everything from non-alcoholic mocktails with baked chips and salsa to bacon quesadillas and a veganized version of the molten chocolate cake (my dearest is allergic to milk). This is our alternative to spending $40 on a night out... and we'll get to prepare and cook it all together! I love experimenting with new recipes. I love this site! Thanks for helping me spice up my marriage! Our next date will be a trip to the temple, dinner, then put the kids to bed early, turn on some music, light some candles and ya know. I am hoping to do the library/bookstore date later today. My hubby love conversation hearts, so when I found them on clearance after valentines day I bought them all. A few months later I gave him a "heart attack" all over his work truck. We have been married for 15 years. So to celebrate our anniversary, we went to the church where we had our engagement pictures taken and took new ones in the same poses and locations as the ones we had taken when we were just starting out. (only this time we were using the camera timer and propping the camera up with twigs and such, it was pretty comical) But we got some great shots and we plan to do this every fives years or so. Just for documentation. It was really fun to remember that day and to see how far we've come together. i am a follower! i LOVE the at home adventure dates that you come up with. helps me come up with other ideas to keep it interesting and cheap. going out can be REALLY expensive. i'm hoping to try the vegas date idea of your soon. my email address is cambric_starfishATyahooDOTcom. I just became a follower thanks to Simply Sweet Marriage. I love their site. I've guest posted for them once, and I was so willing to do it when they asked me because I love the emphasis they are putting on marriage. Too often the ones we love most are pushed to the side, and they are a reminder that we need to keep our priorities straight. So, when they linked to you guys, I immediately checked you out and love what you have. Love it! So much so that I'm officially a follower now! :) Next date: Nothing real special. My parents are taking us to Disney in a couple weeks and we set aside some time to plan what we want to do there. We are going to watch a classic Disney movie, pop some popcorn, cuddle on the couch as we sing along to the songs, and plan out the Disney week. I am loving ALL of your comments...thank you all so much! I wish I could buy all of you this book!! Our next date will probably be an evening alone to the movies and dinner at a nice sit down restaurant with no screaming baby. Maybe a nice walk downtown to a nearby ice cream eatery for desserts. We follow you over here at Casa Camacho. You have an inspiring blogsite. I intend on slipping this book in my husband's things for when he travels. He is a wildland firefighter, so he travels the nation during the summer. It gives him lots of time to read and take notes!!!! Stopping by from SITS and hope you have a great day! Love your blog! Check it frequently, but just became a follower to enter this contest :) Here is my plan for Halloween this year! Wash yourself clean, Then find your next clue! Do you dare test this old folklore? Then, on thursday, I'm going to go pick up 5 pumpkins, and hollow them out, and carve stars all over them, hide them until he's on the treadmill and place them around the living room. I'll have to set everything up while he's on the treadmill & in the shower.. I hope he likes everything!! Any other ideas??? I can't think of anything else, so any input would be greatly appreciated! I'm now a follower- like what I've seen here! I really like your Christmas in July idea! This weekend the kids are staying overnight at my sister's so dh and i can have some alone time. First a temple trip, and then home for a romantic evening. We hope to get to a movie - something we haven't done in over 5 years!!!!!!!! My wifes birthday is this weekend and she has to work for four hours. During that time I am going to cook, Shrimp, crablegs, taters, corn on cob and other items then throw her a party then we are going out to a movie which my wife loves to do. Then maybe something a little later that night for her. 2. I havent seen my hubby in 8 weeks! He is coming home Sat and Im surprising him with a get away to the Armstrong Mansion B&B in SLC! Thanks for always putting up great marriage, love-y sites :) This is a fabulous one! The games look really fun, and I LOVE that they have free cute printable cards! I'm following your blog and love it! I will rub his feet...something I never do because they are so rough! 1. I've been a follower since your "Movies in the Park" idea. Tried it. Loved it! I'm falling in love with "Simply Sweet Marriage" It also has some great ideas! I am now a follower! I'm planning on fixing my husband a nice and romantic dinner just for the two of us. We've been preoccupied with out own agendas lately so I think this might help...the book would be great too! Thank you for a chance to win this great book. I'm very excited about the chance! My husband is the romantic one, darn. So, I'd use this book to try and be romantic. I need some serious help in that area of my life. The best I can do for "romantic" is cooking dinner, and with my pregnancy so far, that's too hard to do! argh. Thanks for all the great inexpensive ideas! Our next date will be our anniversary so I am going to Kidnap him and take him to a picnic dinner down by this beautiful canal (with a great view) behind our house. Then we can sit out and look at the stars (something we did when we were dating) then head back inside for a romantic evening. I'm already a follower. I was thinking about using your "army night" this next week for our anniversary because it falls mid-week and we both have prior engagements on Saturday. My e-mail is cassirash@gmail.com. Love your site, thanks! I'm thinking that the next romantic thing we'll do is have our own temple night. It's been a LONG time, sadly! What's more romantic than eternity??? Loved the Simply Sweet site! Thanks for the link. Our next date night? Heading to Vegas next weekend for our anniversary! =) You've done an amazing job on this cute blog, I love it Cher!!! I am a follower!!! Loving your blog :) My next romantic date idea is our FIRST NIGHT in our new apartment together! We are moving in for the first time to start law school, and on our first night I plan to make dinner for us and present him with the scrapbook I made about our relationship :) Very simple! I can use this site!!! I have been married for 6 years ( on the 16th) and I need all the help I can get! Thanks for the opportunity! I am a follower...as of today. I love the idea behind your blog. Love Actually is my guy and I's favorite movie too! He is currently out of town until the end of August so we won't be able to see each other until then. But, I plan on sending him a letter telling him what I love about and why. I'm a follower! I love the romantic scrabble idea. Hehe. I also really like Simply Sweet Marriage's site. I just became a follower :) Honestly, I don't have any brilliant ideas, so I'm going to be reading up on your blog, and check into this book. Our relationship is in need of some serious spicing up... I sure hope I win! I just found your blog from Simply Sweet Marriage and LOVE it. So many great ideas. I'm now a follower. I think for our next date we'll just go on an evening walk by the river. Okay....Giveaway is now closed--Thanks for entering everyone! Be sure to thank Simply Sweet Marriage for giving you the chance to win! Winner will be announced soon! !